Windows 7 Unknown Device FIXED If your computer doesn't recognize your Arduino and won't install the proper drivers, this fix may work. I used it for my Arduino UNO with Windows 7 64-bit, so steps may vary for other devices and operating systems. Arduino - What bits to start with...and a bit of head bashing! Meel Limor "Ladyada" Freid at Adafruit Industries! My 13 year old son introduced me to a new world off small affordable computers and microprocessor boards with a casual comment about a new computer he had heard of called a Raspberry Pi. After a few quick Google searches I was ordering my first Raspberry Pi and Arduino Leonardo from Adafruit..
Learning to play with these things has been a wonderful experience. I can thoroughly recommend both the Raspberry Pi and the Arduino as both fun and extremely powerful and affordable computer and programming platforms. The Arduino is an open source open hardware platform that is affordable and easy to use. I would highly recommend that if you have any interest in connecting a computer to the real world e.g. reading sensors and controlling motors etc that you take a close look at the Arduino family of microprocessor boards. The programming language and IDE is based on Processing which is handy because I have some experience with using processing. If you have no programming experience it is still an excellent environment to start to play with. You can even purchase Arduino Compatible boards with built in GSM/GPRS which means that you can send and receive SMS messages using the mobile phone network from an Arduino sketch (program) which has lot's of interesting possibilities. E.g. monitoring movement sensors and automatically sending an SMS message if movement is detected. Arduino and GSM - together at last! If you're interested in making Arduino boards communicate via the mobile phone network - the new GBoard is the answer. It's ideal for those Arduino projects that communicate via GSM cellular as the GBoard is not only an Arduino-compatible with an ATmega328 - it also has a SIMCOM900 GSM module - and is cheaper than a seperate GSM shield. Recently I was asked by the first lieutenant at the Ballarat fire brigade where I am a volunteer fire fighter if I would be able to build a "traffic light" system that would turn on a red warning light that would turn to green when the fire station door was full raised. I immediately thought now that I have learnt to use the Arduino that I could make a system to do that. Today I spent the day building and programming a system based on a Raspberry Pi that does exactly what we require. After I built the system using a Raspberry Pi I decided to build it using an Arduino because it would be more portable and easier to demonstrate at the station. And also that I would run the finished design using an Arduino and not a Raspberry Pi because it would cost less and be simpler. Item #: PSTK-240 from powerswitchtail.com to switch a pair of Red and Green spot lights or similar. I ended up purchasing a pair of 12V pond lights and putting coloured reflector globes in them. They work quite well. And I am very happy with the PowerSwitchTail 240 Kits. to the circuit board. The top switch (topSwitchAPin = 9) is normally closed. door is closed most of the time. I have also been playing with the Arduino which I purchased from Little Bird Electronics. 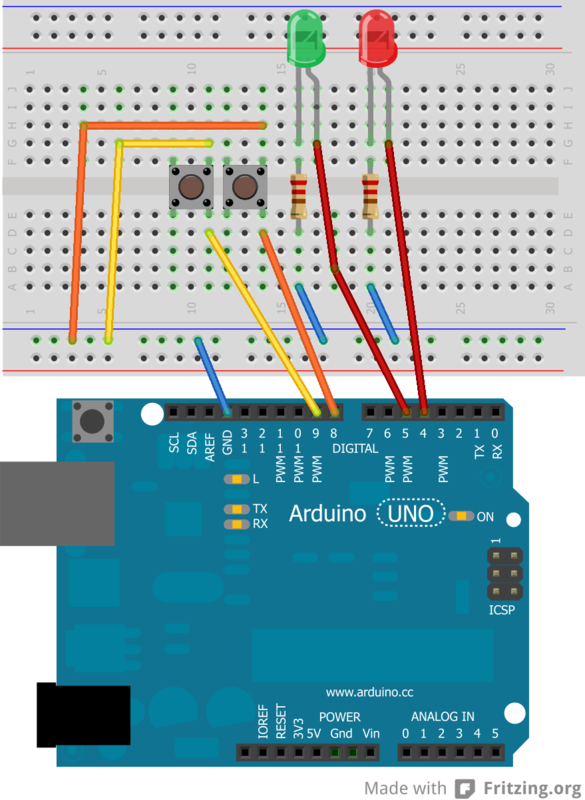 I can recommend the Arduino as a fabulous useful and easy to program microprocessor. I recently made a $45 pledge for the following project. Now and again a great product is announced via crowd-funding (such as Ninja Blocks) and another one has started which we'd like to share with you - by Australian Phillip Stevens. It's his new "Goldilocks" Arduino-compatible board with a difference. Physically compatible with all Uno-style shields at 5 V, however contains a microSD card socket and a much beefier ATmega1284p microcontroller - which compared with the Arduino Uno offers 8 x the SRAM, 4x the flash memory and twice the EEPROM space. Plus there's an extra timer, a fully-independent analogue platform and it's clocked at 20 MHz. If the project is successful the Freetronics team will be taking care of manufacturing so quality will be top-notch. It's a great project and we're happy to support Phillip's Goldilocks board. Russell, R. (2017, August 20, 09:21 am). Raspberry Pi & Arduino.